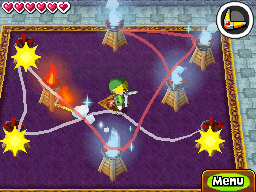 The Legend of Zelda: Spirit Tracks has been out for over a month now and we have started to move back into our regular flow of site updates. However, there are still a ton of Spirit Tracks content projects going on and we got a few of them ready for today. Additionally, we have updated our Treasures page and we have added a Train Parts page for the game. Neither page is fully complete yet as they still need to be filled up with relevant images, but the text for both has come along nicely. That’s about it for now but be sure to check back often as we finish off some of our Spirit Tracks content and provide more general Zelda material. In the meantime, why not take a stop at our growing Zelda Forum Community! The boards have been more active than ever before in the last month so now is a great time to jump right in.